Water damage can occur through a number of situations like faults in plumbing systems, leaks, water or moisture buildup, weather conditions and multiple other electrical or plumbing issues. It is more common than most people think it is. Many homes suffer water damage, which eventually begins to corrode the walls, wood, carpets and furnishings, thereby damaging the quality and appearance of your house. To prevent these unwanted symptoms of water damage, which, in many cases, may also be irreversible, it is required that you get the damage professionally treated. 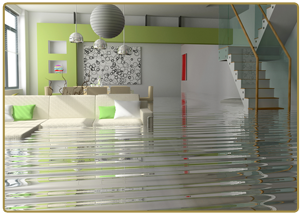 What Unattended Water Damage Can Do to Your Home? If you leave any water damaged areas of your home unattended, it can cause severe issues like buildup of mold, repulsive odors, irreparable damage to flooring and walls, and subsequently an unpleasant image of your home. It can affect both the exterior and the interior of the house. The results of water damage not only degrade the appearance of your living space, but also make it unhealthy for you and your family. Postponing a water damage treatment means allowing the damage time to spread to a larger area of the house. Unwanted moisture does not stay limited to a space; it gets multiplied to surrounding areas like a bacterium. Therefore, we recommend that you seek professional help as soon as you notice signs of water damage. 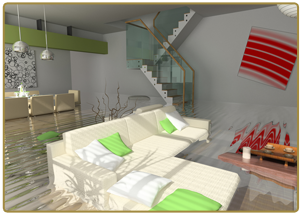 At Versatile Cleaning Group, we believe in offering the best services at competitive rates. Our restoration tasks are aimed at removing damage at all the affected areas so that it doesn’t reoccur. Unlike many other restoration companies, we do not just do a superficial restoration job for you. We make use of advanced dehumidifiers to dry areas affected by water damage. Using special techniques we also dry-out the carpets while disinfecting them and treat them against probable discoloration. In short, we do everything to ensure that your property gets back to its pre-damaged state. 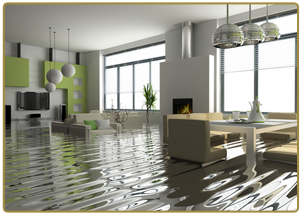 Do Not Allow Water to Ruin the Prestige of Your Home, Call Us Now! Maintaining a healthy home is one major step towards maintaining a healthy lifestyle. Water damage is a sign of poor home health, which you must treat as effectively and as promptly as possible. Get in touch with Versatile Cleaning group to find answers to your water damage related queries and a quote on our restoration services. Our emergency flood clean-up service is available 24×7. Call us for emergency response at 317-537-7147.